This article claimed that the central geostrategic concept during the Cold War with the Soviet Union, Mutually Assured Destruction or “MAD” — in which there is no such thing as the U.S. or the U.S.S.R. conquering the other, because the first of the two to attack will itself also be destroyed by the surviving nuclear forces of the one responding to that attack — will soon be merely past history (like the Soviet Union itself already is); and, so, as the short form of the article said, “nuclear primacy remains a goal of the United States”; and, as the long form said, “the United States now stands on the cusp of nuclear primacy.” In other words: arms-control or no, the U.S. should, and soon will, be able to grab Russia (the largest land-mass of any country, and also the one richest in natural resources). Neither version of this article mentioned the key reason why nuclear victory is exceedingly dangerous even under the most favorable conditions, which reason is the concept (and the likely reality in the event of nuclear war between the two superpowers) “nuclear winter” — the scientific studies showing that a resulting sudden sharp cooling of the atmosphere after all those enormous explosions would produce a global die-off. America’s aristocracy and its vassal-aristocracies controlling the U.S.-allied nations (billionaires, centi-millionaires, and their top agents in both the public and private sectors) are buying and building deep-underground nuclear shelters for themselves, but they wouldn’t be able to stay underground and survive on stored feedstuffs forever. (As for everybody else, those other people are not involved in geostrategic decisionmaking, and so are being ignored.) However, many of America’s (and associated) elite are paying those bomb-shelter expenses, but none of the West’s elite are condemning the path toward nuclear war that their governments are on. So: buying or building nuclear-war shelters is more acceptable to them than is stopping America’s planned conquest of Russia. The higher priority is to conquer Russia. A far less influential scholarly journal, China Policy, published later in 2006 a critical article arguing against nuclear supremacy, but that article has had no impact upon policymaking. Its title was “The Fallacy of Nuclear Primacy” and it argued that, “American nuclear supremacy removes the root source of stability from the nuclear equation: mutual vulnerability.” It presented a moral argument: “U.S. leaders might try to exploit its nuclear superiority … by actually launching a cold-blooded nuclear attack against its nuclear rival in the midst of an intense crisis. The professors discount significantly the power of the nuclear taboo to restrain U.S. leaders from crossing the fateful threshold. If crisis circumstances grow dire enough, the temptation to try to disarm their nuclear adversaries through a nuclear first-strike may be too strong to resist, they argue.” The concept of “nuclear winter” wasn’t even so much as just mentioned (much less dealt with) in this article, just as it was ignored in the two that it was arguing against. Thus, nuclear primacy has become U.S. policy, and MAD no longer is U.S. policy (though it remains Russian policy). The U.S. government is planning to take over Russia (basically, to install a puppet-regime there). That’s the reality. In other words: America’s aristocracy aren’t necessarily hoping to protect all of the U.S. population from a counter-attack, but are willing to sacrifice perhaps a few million Americans here and there, in order to achieve the intended result: conquest of Russia. The article even notes that: “Other analysts have noted that the current U.S. nuclear force looks surprisingly like an arsenal designed for a nuclear first strike against Russia or China.” And, “A group of RAND analysts agrees: ‘What the planned force appears best suited to provide beyond the needs of traditional deterrence is a preemptive counterforce capability against Russia and China. Otherwise, the numbers and the operating procedures simply do not add up.’” So: the co-authors here are claiming to be merely giving a name, “nuclear primacy,” to America’s existing strategic military policy — not to be inventing or creating it. They are, above all, saying that this is the reality now in U.S. policy-making circles; that MAD no longer is. And their article has, indeed, described the guiding strategic-planning objective not only of the George W. Bush Administration, but also of Barack Obama’s — as will now be documented. U.S. President Obama has always been saying that the reason why America is installing anti-ballistic missiles (“ABM”s, otherwise known as ballistic-missile defense or “BMD”) in Romania, Poland, and other nations that border (or are near to) Russia, is in order to protect Europe against Iranian missiles that might be aimed against Europe. He says that this is purely defensive, not aggressive, and that what it’s defending from is Iran, not Russia — so, Russia has no reason for complaint about it. But then, Obama reached his nuclear deal with Iran; and this deal ended, for at least ten years, any realistic possibility that Iran would develop any nuclear-weapons capability — Obama himself emphasized that this was the case; he wasn’t denying it. The thing that seemed to have led our American partners to build an anti-missile defence system is gone. It would be reasonable to expect work to develop the US anti-missile defence system to come to an end as well. [But] What is actually happening? Nothing of the kind, or actually the opposite – everything continues. He called Obama there a “liar,” and that’s a blatantly truthful characterization of the situation. But Putin missed there saying what’s even more basic for an understanding of what Obama was doing in this matter — and which makes that “lie” from Obama particularly heinous: Putin missed saying that an anti-missile system can be at least as important as an aggressive weapon as it is as a defensive one, because if a first-strike attacker wants to eliminate the defender’s ability to strike back from the attacker’s first-strike attack, then an anti-missile system is the weapon to do that, by eliminating the defender’s missiles before those strike-back missiles can reach their targets. It nullifies the other side’s defense — and to do this is enormously aggressive; it strips the victim’s retaliation. The whole distinction between offensive and defensive can thus be pure propaganda, nothing having to do actually with aggressive and defensive. Whether the use will be defensive, or instead offensive, won’t be known until the system is in actual battlefield use. Only the propaganda is clear; the weapon’s use is not. Vlad, its supposed to, its called defense. The only way it could harm your nukes is if they were shot down…………….after you launched them! How can a defense system threaten anything? Like Obama would attack Russia. That is laughable. Most people’s minds are straightjacketed in bigotries of various sorts, preconceptions such as that a “missile defense” system, and a “Defense” Department, can’t be aggressive — even extremely aggressive and war-mongering. The first thought that comes to mind about anything that’s ‘defensive’ is that something else must be ‘aggressive’ or ‘offensive’, and that whatever is ‘defensive’ (such as an ABM) is therefore good and even necessary. That’s thinking, and receiving the term “defense,” like thinking just one move ahead in a chess-game, but this is the mental limit for most people, and every propagandist (such as the people who professionally design propaganda or PR slogans and campaigns) do precisely what Obama and the rest of the aristocracy and their agents do in order to deceive their gulls: they phrase things for one-move-ahead-limit thinkers, like that. The cardinal rule in the deception-professions is therefore, first, to find people with the desired prejudices, and then to play them as that, with one-move-ahead-limit sales-pitches, which are directed to precisely those prejudices. This report at the Breitbart site was instead presenting a high-quality news-report, to a low-quality audience, and so the reader-comments it generated were few, and generally hostile. Obama is a master at deception. Another good example of this was 26 March 2012, during Obama’s campaign for re-election, when he confidentially told Dmitry Medvedev, “On all these issues, but particularly missile defense, this can be solved, but it’s important for him [the incoming President Putin] to give me space. … This is my last election. After my election, I have more flexibility.” Obama was privately communicating to Putin (through Medvedev) that Obama was pushing the ABM installations only so as not to be politically vulnerable to charges from the knee-jerk Russia-haters, Republicans, and that Obama’s fakery regarding the supposed ABM-target’s being Iran was only in order to appeal to yet another Republican bigotry (against Iran), and so Obama was intending to back away from supporting the ABM system during his second term. But actually, Obama had had Russia in his gunsights even prior to his coming into office. Two specific objects in focus were Moscow-friendly leaders of nations: Assad of Syria, and Yanukovych of Ukraine. 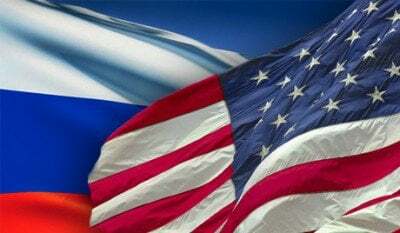 America’s strategy, ever since 24 February 1990, has been to strip Russia of allies and friends — to leave Russia increasingly isolated and surrounded by enemies. When Obama entered the White House on 20 January 2009, there already was a plea in the pipeline from the Syrian government for urgently needed food-aid to address the all-time-record drought there, which had decimated Syrian agriculture. Obama’s Administration never even answered it. Well before the Arab Spring demonstrations in 2011, Obama was hoping for turmoil in Syria and the overthrow of Assad — lots of starving Syrians would be just the thing. Moreover, the planning for the February 2014 coup to overthrow the Moscow-friendly democratically elected President of Ukraine, Viktor Yanukovych, started in the U.S. State Department by no later than 2011. So: when Obama told Medvedev and Putin, on 26 March 2012, not to worry about Obama’s intentions toward Russia, he was lying. He wanted his intended victim to be off-guard, unprepared for what was soon to come. On Obama’s way out the door, he did two things that significantly advanced America’s ABM-BMD threat against Russia. One of Obama’s last actions as the U.S. President was to sign into law a bill that had been quietly passed in Congress, which included a key change in U.S. law that would enable the government to spend unlimited funds on realizing former President Ronald Reagan’s dream of a space-based ABM system, “Star Wars.” On December 22nd, David Willman of the Los Angeles Times, headlined “Congress scrapped this one word from the law, opening the door to a space arms race”, and he reported that the eliminated word was “limited.” Willman explained that, “The nation’s homeland missile defense system is designed to thwart a small-scale, or ‘limited,’ attack by the likes of North Korea or Iran. As for the threat of a large-scale strike by China or Russia, the prospect of massive U.S. retaliation is supposed to deter both from ever launching missiles.” He noted: “The bill awaits action by President Obama. The White House has not said what he will do.” Willman also noted that on an earlier occasion, “the Obama administration criticized the changes in the Senate bill, saying it ‘strongly objects’ to removing ‘limited’ and to placing anti-missile weaponry in space. The statement stopped short of threatening a veto.” But then, the next day, on December 23rd, Willman bannered, “President Obama signs defense bill that could spur new space-based arms race”. Whereas Obama’s public rhetoric portrayed himself as being the type of person who had deserved to win the 2009 Nobel Peace Prize, almost all of his actual decisions in office were the exact opposite — and here was a superb example of that.